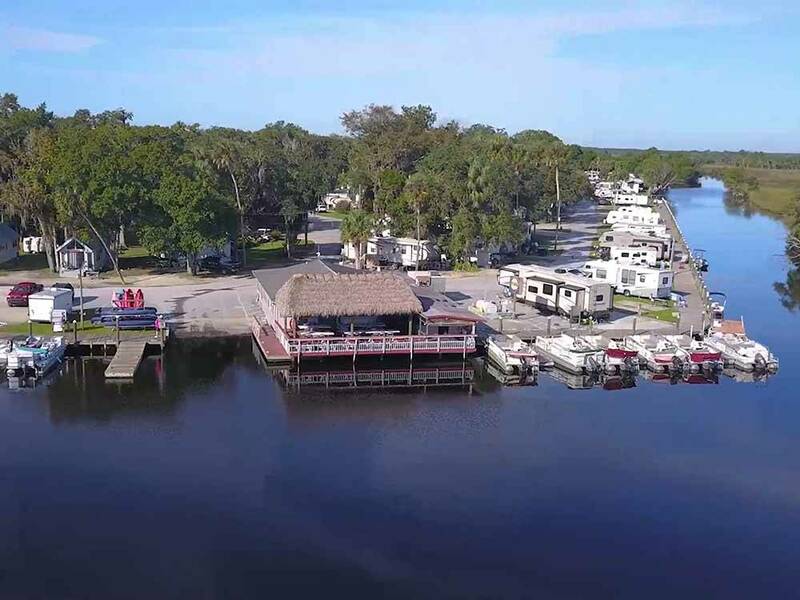 Experience the magnificent Florida Gulf Coast environment with exotic plants and animals while enjoying affordable rates on great RV and tent sites. The park's marina on the Halls River allows direct Gulf access. We stay in many campgrounds in our travels from our Pet resort in NH to our small Bed and Breakfast on Big Pine key Fl, We love natures resort, Super pet friendly. Tons of fun and friendly people. My favorite campground and we go out of our way to stay there at least 3 times a year for as longs as we can. Its not perfect!! sites are crammed together in many places especially near the water. Thats really my only complaint but the tiki bar and fun activities that go on every night is so much fun. The staff is wonderful and I cant wait to go back again and again. Love Fred George and the live bands on the weekends. Wish they had every night!!! We have a dogshow in Lakeland mid February and we are leaving early so we can sneak in a few days at our favorite camping spot!!! Check this place out!! Great kids playground and pool. boat rentals and more!! Love love love Natures Resort!! This was the worst camping experience we have ever had. We arrived on a Saturday afternoon to speeding 4-wheelers/golf carts and vehicles--many driving with a beer in hand. At the ice cream social that afternoon, they had a bar set up serving beer. There is a bar/restaurant at the marina that only encourages more drinking. It was dangerous to walk our dog along the side of the road. Vehicles and golf carts were double parked on both sides of the road, making it difficult to even get a camping trailer into the site. To add to the confusion, kids were bicycling, riding scooters, and driving some of the golf carts. There was a lot of redneck music turned up so that most of the campground had to listen to it, in addition to the drunks trying to sing and even screaming and yelling at each other. The bathrooms were dirty most of the time, and no handicapped showers or stalls at the bathroom closest to our camper. On Monday, after most of the weekend campers left, the campground was more enjoyable, but come Friday they started coming in again. The people who pulled into the site next to us set up a big screen TV outside the camper and left it on all night, So happy to leave this campground-we would have turned around on the first day and left, but had already paid for the entire week. Before we book another campsite, we will ask the following: do you allow alcohol, what time is quiet hour, and do you enforce it; along with enforcing the speed limits in the campground? We were trusting Good Sam's ratings and were really disappointed with this campground. Stayed 3 nights, including a Saturday. Our overall impression was that it is crowded, messy and dusty. Our site was so narrow that when sitting at our picnic table we could reach out and touch our neighbours sewer hose. A lot of full timers and permanent residents, with ugly awnings and decorations that give the place a "trashy trailer park" ambience. Vehicles raced through the park all day and evening, no speed bumps or security keeping an eye on things. The pub at the far end of the campground meant that on Saturday night trucks were racing past our site till late in the evening. Would not stay here again. We are surprised at the current Good Sam rating. The sites were close together in most cases but there was enough room for our two bumpouts. The site we had was nice and level. It was gravel and sand. They have a little restaurant with the tiki hut on the river which was nice. The office included a little grocery which came in handy. We were there from Thursday though Sunday. They had the pool closed until Saturday afternoon for some reason and it was full of children that day. They had activities but we did not participate so I cannot say what they were like. They had laundry facilities which looked good and they had some games in the club house. The bathroom was clean and so were the showers. Not fancy but clean. Near the lagoon they had a fire ring and porch swings which was really nice and they also had a tiki hut there. They had seating all around the lagoon which was also nice. On the negative side the roads in front of the site were unbelievably busy. I found that nearly no one walked they all took trucks, SUV's, cars, ATV's or golf carts. We did not bring any of these things and found it just about impossible to walk our dogs or even just walk ourselves to a facility. It was like a busy street in the city but with no sidewalks. it seemed that people just drove around in circles for something to do as we saw the same vehicles over and over again. We decided if we go back we would do so out of season because there will probably be less traffic. The area they called a dog walk area is a road back to the parking for boats. It was a single lane and not very safe to walk your dog if a boat was being brought in or taken out. On the plus side it was the only time we did not run into traffic. This park is what we imagined "old Florida" to look like. The park is quite large but the winding streets hide the size. A complete circuit of all the streets is about 2 miles. The of the sites are mostly to fully shaded. Only a few - down by the water and marina, do not have much shading. New WiFi towers are everywhere and service is great. The cable has about 70 channels. A big number of the sites seem to be occupied by full time RV's. Mostly 5th wheeler and Class A RV's. These homes are very well maintained and landscaped. An important note to travelers: - call ahead and make sure the staff knows exactly what your site requirements are. Many of the sites are 50 amp - but not all of them. Many of the sites have concrete pads - but not all. Many of the sites can accommodate large RV's - but not all of them The staff genuinely wants everyone's stay to be enjoyable so call ahead so they can place you properly. The waterfront area is very natural looking - no houses or commercialism. The restrooms in the main building were fine. The restrooms supplying some of the loops of the park were more like one would fine at a public park. Because this is NOT an age restricted park, the bathrooms seemed a little more well used, children returning from the beach are typically more sandy. This is a casual park. Some folks seem to be working.The there were often families playing in the pool. Fishing is a activity many people pursue. We had difficulty managing the sharp turns leaving the park and caused some damage to our unit. Partly our fault, & partly because the roads were set up when a 30 foot RV was a really big one. Our RV is 37 feet plus a full size truck. Our site was OK, there were some really wonderful sites, shady and large, and some were OK. We feel this is a park that has grown over the years, some areas are more desirable than other areas. I called from 300 miles away early in the morning to check if they had any available spots. after they asked about the size of my rig and electric requirements, the woman proceeded to take my information and charge my credit card for the reservation. When we arrived over an hour before their posted closing time, to find the office closed and the papers with my name on them taped to the front door. we were surprised when we arrived to see the amount of flood waters in the park. we proceeded to the spot assigned to us was about 4 inches deep in water and too small for our trailer. I called the number to the park and the lady at the store at the front of the park answered and told us another site to go to. We arrived at that site to find the back half of site where the electric connections were located was about shin deep in water, as well as the site was blocked by a car. I went to the store to talk to the lady there, she said that the sites she gave me were just fine. I replied that i was not going to risk my families safety due to flooding, and would seek higher ground to stay at. I stated that I should have been informed when I called that morning that they were flooding due to heavy rains. I asked about a refund, and was told that they did not give refunds, they might give me a voucher for a stay at another time. I replied that I would probably never be back that way again, she said that is too bad, because they did not give refunds. I told the lady I talked to about the reservation that I was 300 miles away. I called the next day to ask for a refund. and was very rudely told they did not give refunds, and as I tried to discuss my reasons I felt I should receive a refund I was told again very rudely that they did not give refunds and hung up on me. I can not comment on any of the facilities, but I do agree with other reviews that the spaces are very small and close together. The park has many permanent or long term residents, and there were kids driving golf carts in the park and almost hit my rig more than one time. The roads are small with tight turns and were mostly flooded when I was there. I would not recommend this place simply because of the rudeness and failure to inform about the flooding, I felt that was deceptive. 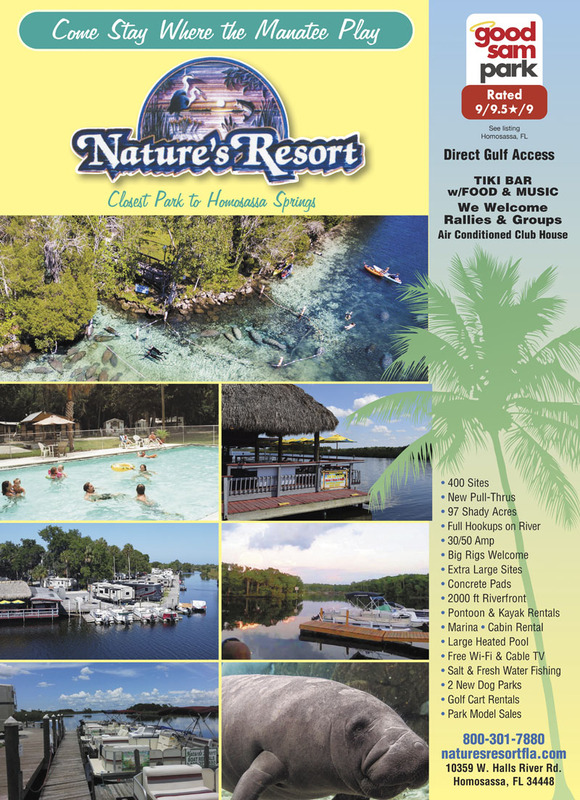 Come stay where the Manatees play! Need rare channel access to gulf waters? Look no further! Great fishing & scalloping right here on site. We are a boating & fishing paradise. A great place to boat & stay.